Well, 2016 is rapidly coming to an end. I haven't posted nearly as often this past year as I had originally intended. Perhaps that will change next year. In any event, here's an update on what's currently under way on the railroad. First up is GP9 1824. This is a Proto 2000 shell on an Athearn Genesis chassis with a factory installed Tsunami. This Genesis loco was one of the early GP9 runs that had the wrong window height and errors in the height of the doors on the long hood. Good friend Anthony Hardy alerted me to a sale in which these locos were going for $135 which isn't a whole lot more than the cost of the decoder. The detail on the underframe, fuel tanks and trucks is outstanding. All I had to do was cut out the coupler pockets on the frame and mount them on the body. The chassis was just finished on another GP9 while the body is in the paint shop. The CWE locomotive roster included a large number of GP9s which were part of the original dieselization of the railroad. Until the completion of 1824, there was only one on the railroad. In addition to this next one, there is another currently in the works. Two more panels have been converted to pushbutton control since the last post. Next up is the panel at Nelsonville. This project will take a little longer to complete as the panel will have two signal repeaters- one for the signal off the Dry Creek Branch and the other for the westbound main signal. Neither of these can be seen from the aisle. The ballast in the east end of Nelsonville has been finished. Some additional weathering around the switches and the installation of switch stands will wrap up the scenery here. I won't finish the track closest to the fascia until the structures are built for this area. The old coach serving as a yard office will be replaced with a structure similar to the yard office at Elk Run on the C&O. There will be several track worker shanties and a RIP shed here as well. The paint shop is full of cars awaiting some weathering. Included in this group is a special car from the Suffolk Northern. More to come on that project. And last up is a PRR X58 boxcar that was just added to the roster. This is one of the new Tangent cars and, in the spirit of the season, it's "a beaut." Here's wishing you a very Merry Christmas and a great 2017! Actually, another two bite the dust. Two panels, that is. Progress continues on replacing all of the older panels with toggles controlling turnouts with new panels that feature route selection pushbuttons. The most recent converts are the panels at SJ Cabin and Logan. The photos below show the new panels. In addition to the new panels, changes were made to the panel at Big Chimney. The picture below shows the first iteration of the panel. While staging the railroad for an upcoming session, I realized that the route selection here wasn't working as originally intended. For example, pressing the pushbutton for the mainline at Switch 373 also aligned Switch 371 for the main. If you had a cut of cars stretching out onto the main from the Helper track and you had just come off the siding at the east end, lining the route up for the main would throw the switch under the cut. Also, pressing the pushbutton for the siding at Switch 373 normalized both Switch 369 and Switch 367. Again, if there was a cut of cars coming of the branch onto the siding and you lined Switch 373 for the siding, Switch 367 would be thrown under the cut of cars. To fix the problem, I added two new pushbuttons- one to normalize Switch 371 and one to normalize Switch 367. The photo below shows the new configuration. Part of the beauty of the Signals By Spreadsheet product is the ease with which changes like this can be made. Simply add a couple of pushbuttons, print up a new panel label, hook up the pushbuttons to the RCS card and reconfigure the card. Next up, I'm going to head back east to the panels at Summit Springs and BA cabin. The panels for the yard at North Pierce are going to be quite a bit of work and I'm planning to save those for last. Getting all of the panels completed on the line east of the yard will also allow me to start on CTC. And that's been the objective of all of this from the start. Slowly but surely, I'm making progress on the scenery around the east end of Nelsonville. It's another one of those locations that requires construction of lots of little pieces in order to get close to "finishing" the scene. And there were several fits and starts along the way. For whatever reason, I never seem to be able to complete a scene from start to finish in a relatively short period of time. I get to a certain point and then have to leave it for a while. And sometimes, a long while. All of this is in part because I've never completely planned a scene ahead of time. I have a general idea of how I want it to look and I can get it started. But sometimes it takes a long period of time before all of the pieces come together. I'll find inspiration in a photo for something in a certain scene and that will get the creative juices flowing again. I'm then off to the next point where additional inspiration is needed and progress comes to a grinding halt. It's all probably the result of a medical condition of some type. After the station was in and the basic scenery was complete at Nelsonville, I needed to finish the eastbound signal bridge before I could go any further. And of course, I would need relay cabinet and power switch machine too. And something to protect all of this from the coal truck traffic bouncing along the gravel road on the way up to Summit Springs. So as the signal bridge was being finished, I thought about what kind of protection for the railroad equipment would be most appropriate. I settled on a "fence" of old rail that would be painted MOW yellow. I cut up code 55 rail, planted posts and added the top rail in a similar fashion to what is seen to the left of HN Cabin in the photo below. Once the fences were built, they didn't look right. Perhaps they will look better once painted in MOW yellow, I thought. But they didn't. It was too much "stuff" in too little space. Everything looked crowded. And it occurred to me that a fence made out of rail such as this would do little to stop a loaded coal truck. I had also made a bollard out of tube styrene and had painted it MOW yellow. It occurred to me that a couple of these might look much better than the fence. So the fences came out and the bollards went in. Here's a couple of shots of the results. There also needed to be a "fence" of some type between the tracks and the parking lot for the station. I really hadn't given this much thought. One day, I walked past the scene on my way out of the railroad room and it hit me. There's a picture in "Chesapeake and Ohio Railway in Color- Volume 1" by Jeremy F. Plant and William G. McClure III of the station at Gladstone, VA that was taken in July of 1973. It shows a guardrail made out of railroad ties and what appear to be creosoted 2 x 12's. When I first saw this photo, I thought that a similar guardrail would be a neat touch to add near a station. So I had found the inspiration. The photo below shows the results. The dwarf signal controlling the eastbound entrance to the main from the yard is now installed and working and can be seen in the photo below. And here's one last shot of the overall scene. There is still more to do, such as adding the steps to the loading dock at the station, weathering the ballast on the main line, adding a switch stand to the turnout to the siding, etc. And of course, all of the yard track in the foreground in the picture above needs a second layer of ballast along with weathering. But hey, at least there's some progress! The crossover between the coal yard and the freight yard is complete. The photos below show the results. The cut of hopper cars in the photo above is sitting on the lead to the coal yard and the GP7 is sitting on Track 4 in the freight yard. The turnout off the coal yard lead is a #6 left hand and the turnout on the Track 4 in the freight yard is a #6 wye. As noted earlier, this connection will enable the crews to hand off freight and coal between the two yards without having to run out to either end of the main yard. The true test of this new arrangement will come during the next op session- we'll see what the yard crews have to say about it. The track crews have been busy at Hollister Yard. The photo below shows the new turnouts that will connect the coal yard and the freight yard. The background story on this can be found here: http://cwerailroad.blogspot.com/2016/04/helping-out-yard-crews.html. This connection will enable the yard crews to hand off cuts of coal and freight between the two yards without having to run all the way out the yard leads. This will be especially helpful in building and classifying the locals, all of which handle both coal and freight. Of course, everything about this little project will be a challenge. Locating the toggle switch for the turnout on the yard panel will require moving a terminal strip that supplies track power to a bunch of toggle switches. Which will, in turn, require some more wiring. And the throw bars for both turnouts are located right over cross members under the layout. So those will have to be moved or reconfigured in order to accommodate the Tortoises. And... well, you get the picture. Actually operating the layout can produce all kinds of fun projects! As I prepared for an upcoming op session, I realized that I needed more track warrants. The warrants are posted on small clipboards that hang from the fascia all around the railroad. This makes it convenient for the crews to grab one before calling the dispatcher for their next move. I usually have to print more prior to each session. And I also need them for the dispatcher. 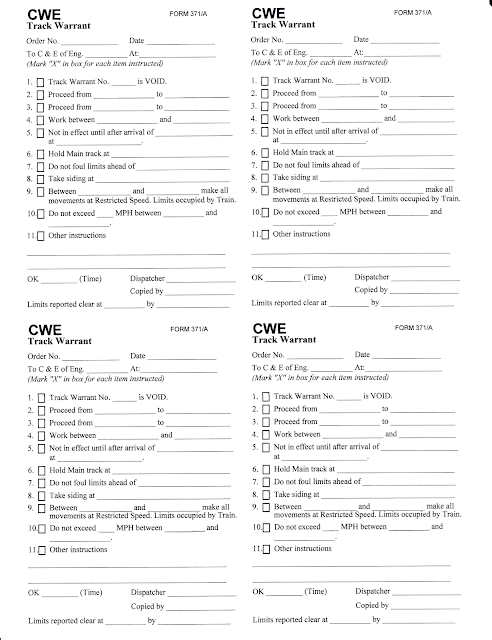 In an effort to save paper, I wondered if I could print the form on both sides and therefore get twice the number of warrants from a single piece of paper. So I printed both sides and sure enough, it lined up perfectly. Well, duh- of course it would. So I printed up a handful of pages on both sides and cut up the new supply of warrants. About this time, I was feeling pretty good about myself. As I also needed a handful of full sheets for the dispatcher to use, I wondered if the full sheet printed on both sides would work. So I printed up a sheet on both sides and turned it over. Wow- this will work great! And then it occurred to me- Jim Rollwage had been doing this forever. 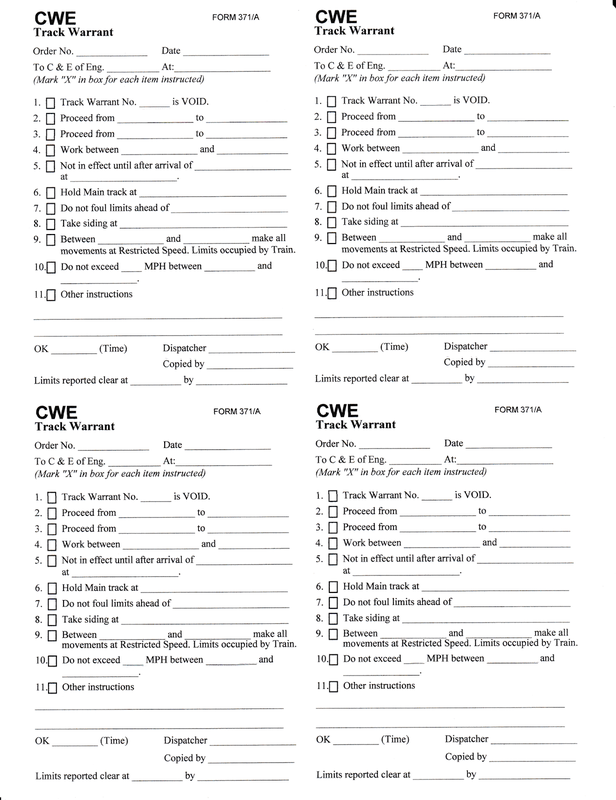 And I've dispatched the Denver Pacific many times using his full page sheets that are printed on both side. This was clearly a double "duh" moment. So I dutifully printed up another five pages- on both sides- for the dispatcher.